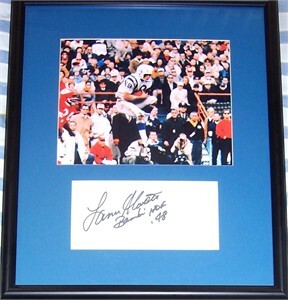 Black marker autograph of legendary San Diego Chargers Hall of Fame receiver Lance Alworth on white paper (with Bambi and HOF 78 inscriptions) professionally matted and framed with a vintage 8x10 action photo, ready to hang. Obtained in person at celebrity golf tournament many years ago. With certificate of authenticity from AutographsForSale.com. ONLY ONE AVAILABLE FOR SALE.